In 1943 Howard W. Suesz (Born Dec. 2 1901), started the Clyde. Bros. Circus. Suesz had purchased the equipment left from the Gandini's Circus, which had folded during the "Great Depression" of the thirties. The circus was set up as an indoor circus, showing in arenas, ball parks and stadiums. The show played mostly for Shrine clubs and temples and other civic organization. 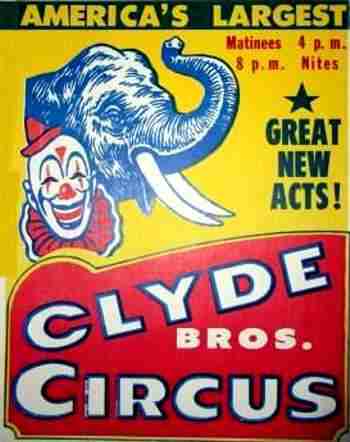 The Clyde Bros. circus toured through the United States, Canada and Mexico. Howard eventuality opened a second unit in order to cover more territory, (Red unit and Blue unit). Suesz briefly changed the name of his Canadian unit to "Rex Bros." to avoid confusion with the Clyde Beatty Cole Bros. Circus which was playing in Canada at the same time. In 1976 the Clyde Bros. Circus was purchased by the "Carden & Johnson International Circus"which operated the circus until 1998.. In 1949 Suesz opened a tented circus, which he called the "Hagen Bros. Circus", which he based in Edmond Oklahoma. Howard W. Suesz died Dec. 13, 1981, he was 80 years old.